Alzheimers symptoms can be hard enough for adults to understand. It's even more important to help your children get accurate alzheimers information. Your kids have fears, questions, and concerns. They're also naturally intuitive, and even if you try to hide your concerns, they sense your frustrations and helplessness. Kids often experience, but cannot articulate their own grief. They carry a great deal of sadness as they see grandparents with alzheimers change and diminish. 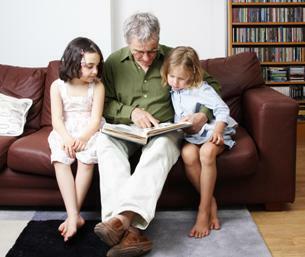 Your children need to know how to participate in their grandparent's care constructively. You can teach kids how to give voice to their concerns and not internalize them. Children can easily take on a false level of responsibility. You can help them understand that they did not cause this disease, and that they cannot fix this. A great way to start is to watch part of an HBO Documentary Series taht was based on a children's book by Maria Shriver, What's Happening to Grandpa? This 30 minute video, Grandpa, Do You Know Who I Am? features insightful conversations with children who are dealing with a grandparent with Alzheimers. You'll hear these kids ask the questions that are most important to them, and speaking about what they fear most. You'll see some excellent models of how talking about these issues openly can empower a family to deal with this crisis in their midst. I'd suggest you watch the film yourself, and then watch it with your kids. It could be helpful for them to know they are not alone. When you click on the link to watch the video. You'll then be able to point to the lower edge of the picture to be able to uncover the controls -- pause -- or to enlarge the picture to full screen. Watching this short film together could give you some new insights for involving your kids in alzheimers home care. Your family can learn new ways to support each other in these difficult days.